Due to some rather complex circumstances, I’ve been using an old Dell Inspiron 2500 laptop as my main working computer for a few months now. I received the laptop from a friend who no longer had any need for it, but apart from a badly damaged exterior casing the laptop is fine. It is about 8 years old, and has a Pentium III processor and 128 RAM. When I received the computer, it ran Windows 98, which I replaced initially with Arch Linux and later, when I realised some odd problems were actually caused by Arch and not the computer, with a command-line install of Ubuntu Hardy (8.04). The computer runs great now. I used sysv-rc-conf and some of K.Mandla’s speed tips to make the machine boot up faster and be more responsive. Even while running Arch, though, the computer ran rather slowly when I tried using the light(er)-weight applications with a graphical user interface I normally use. Thunar and Mousepad, my favourite graphical file manager and text editor respectively, both rather light themselves, took a long time to load or close. What to speak of heavier applications like OpenOffice, or graphical audio players! Multitasking became nearly impossible (unless I decided to make a cup of tea while I waited for another application to load!). It was obvious that the best way to make good use of this computer was to use light command-line applications. Command-line applications are nothing new to me. I’ve been using several of them for a long time: cplay, htop (hiding the duplicate entries through F2 > Display settings > Hide userland threads), nano, rtorrent, alsamixer, and so on. But this dear Dell laptop required a more radical approach: if I was going to be productive on this computer (and I had to! ), I had to minimize my use of applications with a graphical user interface and perform my main tasks from the command line. This was a lot less hard than you may think, and after a few months of working with those command-line applications on that laptop it is sometimes hard to look back. I’ve (re)discovered many great applications, and am using some of those ultra light weight applications now also on my computer at work — a strong beast that could even handle CompizFusion if I wanted it to. Below are a few of the applications that I’ve been using over the last few months, as well as some settings I changed to make working with command-line applications easier. What follows is a record of what I’ve been doing that offers some help to you for achieving the same thing. All of it works fine on my Dell laptop running Ubuntu 8.04, but I can’t guarantee it works on every computer (or other distros). As usual, the man pages are your friend. Since most of my applications would be run in a terminal and I would therefore use the mouse a lot less, I wanted a window manager that could manage my terminals well and that allowed me maximum control through my keyboard, but one that also looked decently. I’ve been using the tiling window manager Awesome for a while now, and that seemed like the best option to use. Openbox ran a bit slower on that laptop, so the speed advantage Awesome gave me was also welcome. To not waste any additional resources on a session manager, I did not install any and start my window manager with startx and .xinitrc (if you have no idea how to do this, have a look at this page on the Ubuntu Wiki). When you reboot, you should only have access to the getty consoles you did not disable. Your X-server should load on the next available console (Ctrl-Alt-F4 in my case). You will not notice a big improvement in speed or responsiveness (at least I didn’t), but it feels good to me to not load anything that I won’t use anyway. This will set the console font to Lat2-Terminus, size 16. The font types and sizes you can use are limited, however. You need to look in /usr/share/consolefonts/ to see what fonts you have available. If you need a different encoding or are looking for a different font style, there are several console font packages in the Ubuntu repositories that you can install (do a search for “console fonts” in apt or Synaptic). For more information on consolechars, see the man page (man consolechars). This sets the VGA font, in the Lat15 encoding, with size 14. Note that you can only specify fonts here that you have installed in /usr/share/consolefonts/. The example I give here points to the Lat15-VGA14.psf.gz package in that directory. Reboot your system, and you should have a nicer resolution and nicer fonts on the console (note the font is only applied later in the boot sequence). Window managers for the console? While the tty consoles are useful, if you plan to use them extensively you’ll need a “window manager” for the console, so you can have more than one application running in each console. There are several available. 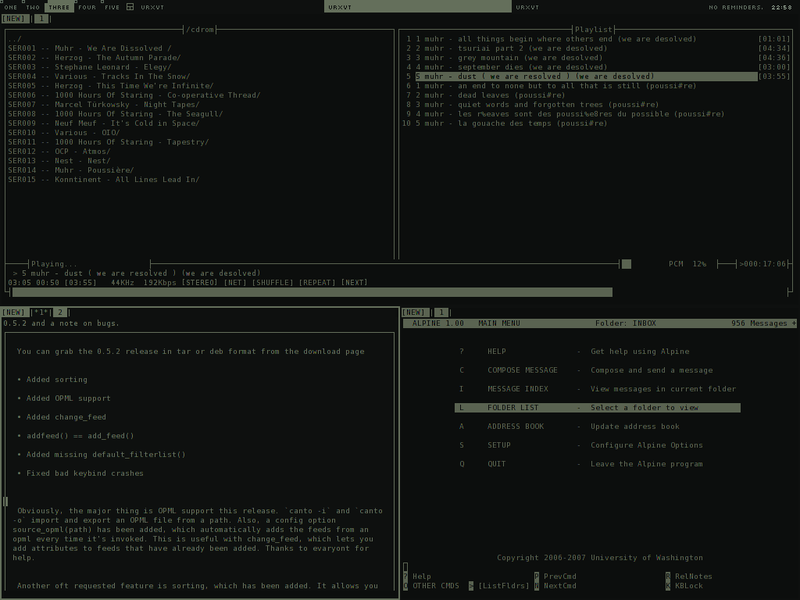 GNU Screen is probably the most popular one, and it is easy to see why. It is very versatile and offers you a lot of control. You can detach ‘windows’ and reattach them later, exiting screen does not terminate processes launched in screen, it has a handy status bar that you can customize to your liking, etc. The Screen homepage will probably not make you much wiser, but there is plenty of good documentation available on the internet to get you started (see for example here or (more elaborately) here). 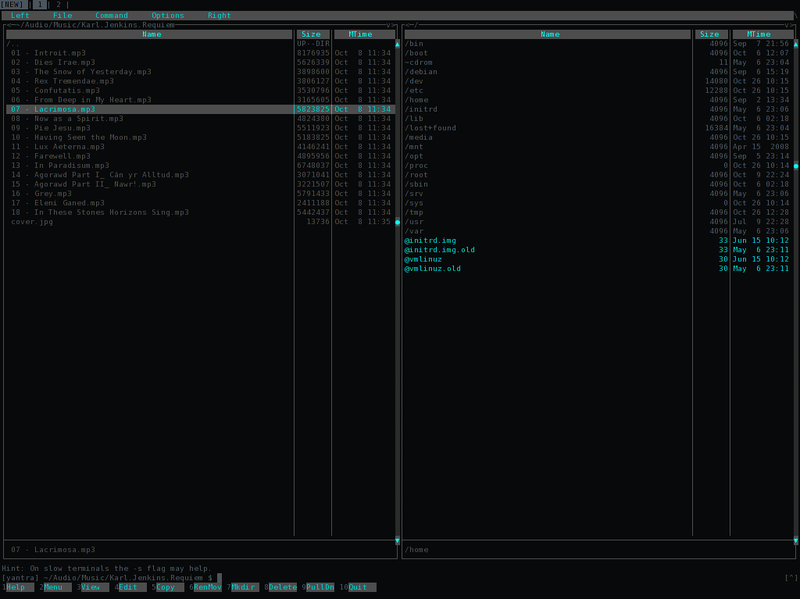 My current favourite, however is dvtm, the “dynamic virtual terminal manager”, a tiling window manager for the console inspired by dwm. You can switch between different modes (maximized, vertical tiling, bottom tiling, or grid)and you (in true dwm spirit) can change the default configuration if you desire by editing the source code (which isn’t as hard as it sounds) and recompiling dvtm. The documentation found on the project’s home page should be good enough to get you started with dvtm. When running command-line applications in X, you’ll need a terminal emulator. I’ve always liked the ease of xfce4-terminal, but that was a bit too sluggish on this computer. I wanted a light terminal that allowed tabbing, and finally returned to urxvt (rxvt-unicode), a terminal I had used in the past but had never given enough time. Urxvt is a nifty terminal. It is light, but very feature rich: read the very long man page to see its potential. It can tint unfocussed terminals (very handy in a tiling window manager! ), it supports tabs, its behaviour colours are easily configurable through your ~/.Xdefaults file, and it supports transparency if that is your thing. To enable tabs, you need the URxvt.perl-ext-common:	default,tabbed line. The URxvt.tabbed.tab(bar)-fg/bg lines specify what colours the fore- and background of the tabs and tabbar will be; the numbers given here (in this case 1 and 0) refer to the colour numbers specified earlier (URxvt*color0, etc.). To open a new tab, press Shift+Down, to switch between tabs press Shift+Left/Right. I’ve been tempted to try zsh as an alternative to bash ever since reading this post a few months ago. Though I’ve been told in several places that zsh is slower than bash, my experience is the opposite. Bash was very slow in starting on this laptop, which lead me to try out a different shell. Zsh, on the other hand, is fast and snappy: it loads almost immediately when a terminal is launched. Zsh is a great shell, and one that is easy to transition to as you can use most of your bash aliases in zsh. But zsh offers so much more than bash: its autocompletion is miles better than bash’s (it has menus! ), it can autocorrect spelling mistakes, you can share history across sessions, and much more. I admit that I don’t use many of the great features that zsh has, but its autocompletion, autocorrection and better history management are reasons enough to stick with it. Adjusting to zsh has, so far, been very easy. In my daily usage of the shell, I have everything I liked about bash and a few more things. The main difficulty has been configuring zsh, but for that there is plenty of good information available online. It is probably best to find someone else’s zshrc file and modify that to your liking. My configuration file is here. This will make zsh the default shell for the username you specify. You’ll need to log out and back in to apply the changes. Zsh has a lot of great features that make working on the command-line so much easier. You can find great tips online (see here and here for example), so there is no need for me to repeat that here. As I mentioned earlier, my beloved Thunar was a bit too big for my new old Dell laptop, and it took me a while to let go of it. But with every 12 seconds (average) it took to launch Thunar, my detachment increased, and after a week or so I resolved to look for a lighter, command-line file manager. That search was over really quickly! I briefly experimented with clex and fdclone (as well as some of the ugly graphical file managers such as Gentoo), but it became very quickly apparent that there is no better command-line file manager than Midnight Commander (mc). Midnight Commander is a very powerful dual-paned file manager. It has something of a learning curve (don’t all good applications), especially if you are used to point-and-click graphical file managers, but once you know your way around it, you’ll be glad you invested the time and energy. If run in X, you can use your mouse with MC, but you’ll only see the real potential of this file manager when you learn to control it from the keyboard. This manual and this article helped me enormously in familiarizing myself with MC, and I created a much used little ‘cheat sheet’ for myself with the most commonly used keybindings to help me learn them. MC is themeable; you can change the colours of every aspect through the ~/.mc/ini file (if you don’t have one, run MC and in the Option menu select “Save Settings”). Note that you need to edit this file while MC is not running; MC writes to this file when it exits, thus disabling anything you’ve changed while MC was running. At the bottom of that file, you can specify the colour settings MC should use. Have a look at my configuration file to figure out how to do this. The possible colours are limited: black, red, green, brightgreen, brown, yellow, blue, brightblue, magenta, brightmagenta, cyan, brightcyan, lightgray and white. Once I realised how much faster Midnight Commander copies files than any graphical file manager I’ve used, I started using MC also at work, alongside my much beloved Thunar. My default text editor is nano at the moment. It is nice and simple and is good enough for most of the simple editing I do at the moment. That it shares many keybindings with alpine, my email client, is a handy benefit. Unfortunately, nano is not the best tool to edit complex text files. Since I spend most of my time on the computer writing, I need something with a little more bling. So far I’ve been using OpenOffice (Abiword just isn’t good enough) and Gedit with the Latex plugin, but I’ve also started to experiment with Vim and Vim-Latex. Though Vim has a reputation of being an editor with a steep learning curve, I haven’t had much difficulty with it so far. On the contrary, I’ve found it to be rather easy to learn. Vim comes with a great tutorial, called vimtutor, that helps you to learn Vim not by cramming keybindings and commands, but by working with those commands. The tutorial lasts about half and hour (depending on how much time you take for it), and after that you should be familiar with all the basics. There are also several good tutorials online (here and here for example) when you require more than vimtutor covers. There is no lack of command-line audio players, and many of them are well known. If you are looking for an audio player that fetches album art, lets you browse Wikipedia, burns tracks to CD, and waters your plants while you are away, the command-line audio players will be a big disappointment to you. But if you are looking for something that plays your audio files without consuming most of your computer’s resources, you’ll have plenty to choose from. Even before I started working on this laptop, I was using Cplay to play my audio files. Cplay is light, has a clean interface and is very straightforward in its use, and if you’re still unsure how to use it, K.Mandla has a great guide for you. Cplay is really a front-end to other audio players, which you also need to install. I recommend you use mpg123 (and mpg123-alsa so it doesn’t interfere with other applications that use alsa) rather than mpg321 to play mp3 files; on all the computers I have tried this, mpg123 uses almost 20% less cpu than mpg321. The only downside to cplay is that it doesn’t allow you to control it with commands. To pause or skip to the next track, you need to do so within cplay. I like to keep my audio player in the background, however, and pause it with a global keybinding (Ctrl+Alt+Space) from wherever I am working. I normally use mpd and a front-end for this, but am too lazy to set up a database and constantly update the database whenever I add some music. I am currently flipping back and forth between cplay and Music On Console (mocp). Mocp uses a little more resources than cplay, but not enough to make a big difference. It has a simple, clean interface the way I like it, and you can easily control it with special commands (mocp -G to toggle play/pause, mocp -f to move to the next track, etc.). Mocp can keep running, as a daemon, after you close it too if you like that. It makes a lot of sense, but before I started using this laptop, I had no idea how much resources are needed to play a video file or a DVD. VLC, Totem and (G)xine made it nearly impossible to have some other resource intensive application running at the same time. Luckily there is MPlayer. And I don’t mean a graphical front-end for mplayer (such as KMPlayer, SMPlayer or Gnome-mplayer), which seemed as hungry as the other video players with a graphical front-end, but the mplayer base you can use with the command mplayer filename.avi. Playing a video file with mplayer on that laptop uses less than a third of the resources any of the graphical players use! Mplayer, without a graphical front-end, offers a host of additional features many of the graphical clients lack. Since there is no graphical interface, you need to navigate and play the video file with your keyboard. The right and left arrows forward and rewind 10 seconds, up and down forward and rewind 1 minute, pageup and pagedown forward and rewind 10 minutes, p pauses or unpauses the video, etc. You can adjust the play speed (with the [ and ] keys), and — one of the greatest features — adjust the audio delay with the + and – keys. In my undergraduate days, before I had a computer I used the computer of my room mate, which ran a version of Suse (if I remember correctly). According to him there was only one good email client and that was pine, so I was forced to use that to handle my emails. After an initial period of frustration, I got used to the interface and the keybindings and liked the simplicity of it. However, when I got my first computer (running Windows), I replaced pine with Netscape and later Opera, which I still use this day for email. Pine has since been transformed into Alpine, which is now once more my email client. It’s interface is simple, as are its keybindings, and it is a lot easier to set up or work with than mutt. I use Gmail, and am able to access my Gmail with IMAP through Alpine. This guide was helpful to set it up, and this guide told me how to get Gmail labels to appear as folders in Alpine. If you’d like a spell checker in Alpine, you can install Aspell (with the dictionary files of your language) and set the speller= option in ~/.pinerc to speller=aspell –mode=email check. Ctrl+T will then launch the spell checker. I’ve finally decided an RSS reader is useful. I never really saw the need to use one until I started using this laptop, and realised that most browsers are resource intensive and that I could minimize their use by using an RSS reader to read most of the blogs and news-sites I normally frequent. It took me a while to find something I liked, though. Raggle is recommended again and again, but I found it clunky. The interface is too complicated for me (I don’t need to see three different windows at the same time), and it used quite some resources on this computer. Snownews had a great clean interface, but only showed the first few sentences of each news item, which defeats the purpose of an RSS reader for me. Newsbeuter was a good alternative, but ultimately Canto, a new feed reader won my heart. Canto was born out of NRSS and has everything I like. It is light, has a sober interface (I really don’t need to see all the links within blog posts), it has customizable keybindings, and it is simple to use and setup. The documentation on the website is great, and the IRC channel is very friendly and helpful. If you run Canto on Ubuntu, you may want to install Debian’s python-feedparser package, as the Ubuntu version still has a bug that doesn’t go well with WordPress feeds (instead of the post titles, you’ll see the author’s name). I’ll be honest. Command-line browsers are not really my thing. I occasionally use Elinks, but it most websites are not made for text browsers, and text browsers easily irritate me. After experimenting with the graphical browsers on this laptop — Epiphany (reasonable, but still a little slow), Kazehakase (which crashed a bit too often), Dillo (nice and fast, but a little too simple), Firefox (too heavy for this laptop) — I returned to the best browser on earth: Opera. Opera is the fastest and lightest graphical browser I used on this laptop (not considering Dillo). I first went through this list and turned of everything I don’t use, and installed the new Flash 10, which is a lot lighter than version 9. After a little experimenting and exploration I now have a fully functional computer, than runs fast and can do a lot more than people expect. I pains me to see people throw away computers with similar specs (or even better!) that are still fully functional, but are ‘slow’ compared to the new computers that are produced today. If this computer was good enough for general use 8 years ago, why would it not be good enough for general use today? People sometimes laugh when they see my battered old laptop case, but are impressed by the speed and power of the applications that I run on it.